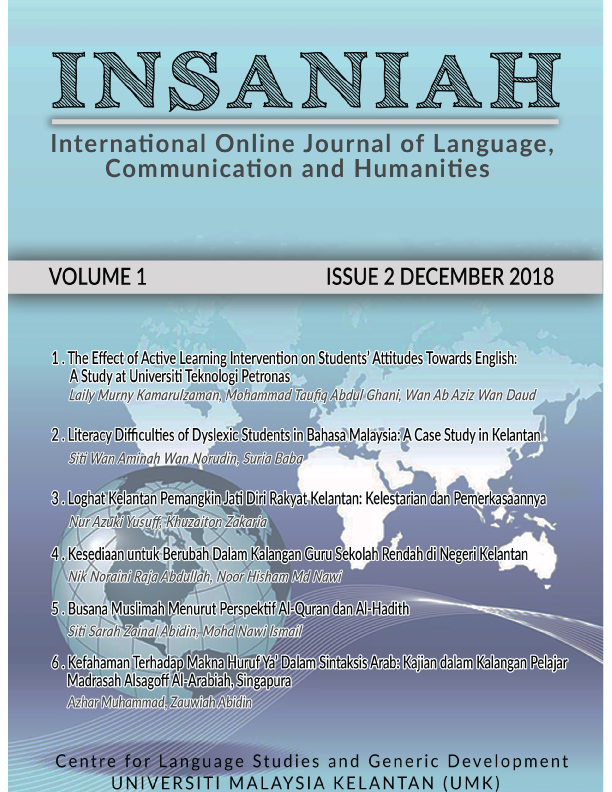 International Online Journal of Language, Communication, and Humanities (INSANIAH) is a high quality peer reviewed, open access research journal that is published online by the Centre for Language Studies and Generic Development, Universiti Malaysia Kelantan. INSANIAH is published twice a year and provides the platform for researchers, academics, professionals, practitioners and students to impart and share knowledge in areas related to language, education, social work, communication as well as history and civilisation. INSANIAH welcomes and acknowledges high quality theoretical and empirical original research papers, case studies, review papers, conceptual papers, literature reviews, book reviews, and conceptual framework. Articles are accepted in English and Malay language. Universiti Malaysia Kelantan Copyright © UMK PRESS, 2018 All rights reserved.